Alan Platt Sands’ passion project to bring the brave soldiers of World War 1’s elite combat unit the recognition that they so richly deserve. Alan Platt Sands at the 42nd Rainbow Division memorial located in Garden City, NY. Garden City, NY - April 2, 2018 - The 42nd Rainbow Division was an elite combat unit consisting of 27,000 men that was formed during World War 1 and trained out of Camp Albert L. Mills in Garden City, New York, before being shipped out to fight against Germany in the battlefields of France. But if you say that you've never heard of the 42nd Rainbow Division – which is still in existence, and currently headquartered in Troy, New York – you're most likely not alone. However, it is one passionate, creative man's mission to make sure that the brave deeds of these soldiers finally receive the recognition that they so richly deserve. Alan Platt Sands – originally of Lincoln, Nebraska, but currently calling New York City home – is a stately gentleman, well dressed and distinguished; he is a screenwriter and educator by trade, and is looking to use his considerable skills to attempt to create an extensive televised miniseries event depicting the drama surrounding formation of the 42nd Rainbow Division, utilizing the mediums of television, internet, and computers in ways, he said, that have never been done before. “I really believe that what I'm doing with live-action drama and actors and combining so many different factors with the story and packaging it for education…I really think I'm doing something innovative,” he said. Sands said that he realized very early on in life that his path was meant to be a creative one; however, hailing from Nebraska and from a business-minded family, he found the pathway forward a difficult one. Sands traveled home upon graduation and worked for a brief stint in the family’s wholesale meat business, but soon packed his bags and headed out to Hollywood to try his hand as an actor. For several years he found a very real modicum of success in that regard, appearing in various roles in film and television. Eventually, however, he discovered himself with a new calling after years of reading scripts that didn't quite pass muster. “The more I had to read the lines on the scripts I was given, the more I just shook my head and said to myself, ‘I can do better than this.’ These actors are not talking to one another; they’re talking AT one another. The interaction just wasn't there,” he said. It was that moment, combined with the later passing of his father – and a subsequent script that he wrote in his memory – that turned Sands towards screenwriting, a passion that he’s been enveloped in ever since. Sands first learned of the 42nd Rainbow Division after attending an event commemorating the 50th anniversary of the death of legendary military General Douglas MacArthur; after participating in the ceremony by utilizing his skills as an actor, he was taken aside by one of the U.S. WW1 Centennial Commissioners at the event and, after complimenting his performance and discovering that he was an aspiring screenwriter, asked him if he was familiar with the 42nd Rainbow Division. 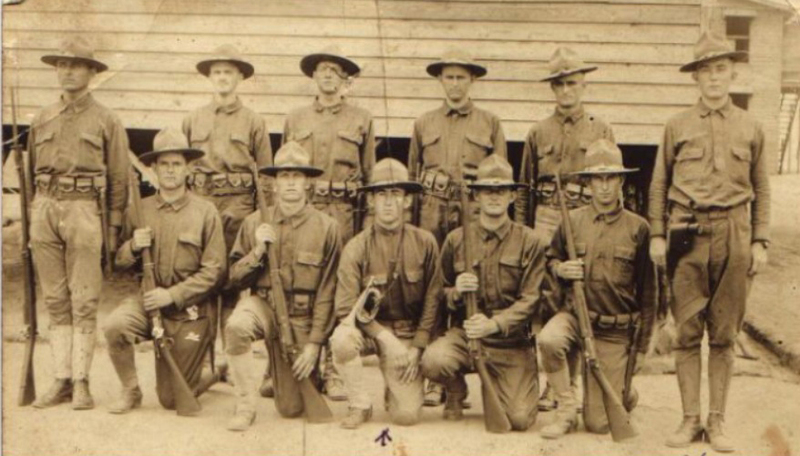 When the United States first entered World War 1 in 1917, the active Army the United States possessed at the time wasn't sufficient enough for the task at hand, Sands noted. Therefore, it was decided by the famous Douglas MacArthur – a Major at the time – that several National Guard groups throughout the country would be combined into one force, trained, and sent over to Europe to fight. Thus, the 42nd Rainbow Division was born, but initially putting the group together was no easy task, Sands said. Sands was enamored with the story of the 42nd Rainbow Division, and felt it was truly destiny that he take on the job of conveying their story to the public when he discovered that the Division’s official historical archive was actually located in his hometown of Lincoln, Nebraska, housed within the library of the local University. After getting the school’s permission, he set about on an extensive amount of research utilizing the archive’s resources, work that would form the foundation of his plan for an extensive miniseries event chronicling the group’s exploits. After finishing his four-month stint of research at the 42nd Rainbow Division’s archives in Nebraska, Sands made the leap of moving to New York City to continue his work, hoping to take advantage of the many acting and producing contacts available in the theater capital of the world. Since then, Sands has spent the last three years living simply and working tirelessly to bring his passion project to life. Currently, he has a treatment written - which is a general outline of the entire series - as well as a script written for a teaser trailer. He is currently in the process of raising the funds needed to film the teaser, and once it is complete, Sands intends to shop it around to various networks and streaming services in order to find a full backer for the entire series. Sands said that he envisions the story of the 42nd Rainbow Division as an eight-part miniseries, with each part clocking in at approximately 45 minutes. The innovative aspect of the miniseries, he said, is the fact that he intends to supplement the television aspect with a range of interactive features, including authentic World War 1 newsreel footage, social media, virtual online museums, and even a tie-in video game. "The series will be epic in scope and innovation. I truly believe this miniseries will be produced, simply because I wont stop in my efforts until it is," he said. "The educational importance of preserving this period of our nation's history needs to be passed on to future generations of Americans. I’m a man on a mission because WW1 was the most catastrophic event of the 20th century, one that changed our world forever, and it needs to be understood by all." While the 42nd Rainbow Division’s footprint upon Long Island is now but a distant memory, there still remains something tangible in Garden City to mark its passing. Located at St. James Street South and Clinton Road - the former location of their training base of Camp Albert L. Mills - is a memorial to the Division, recently restored to mark the 100th anniversary of the group's formation in 1917. The memorial consists of a large marble obelisk pointing skyward, adorned with a rainbow, illustrations, and factoids; a mute testament to the many brave men who overcame their differences and fought for what was right during one of the most trying times in mankind's history. If you're interested in finding out more about Alan Platt Sands’ work on the 42nd Rainbow Division miniseries, and want to get involved yourself, you can contact him at alanpsands@gmail.com. 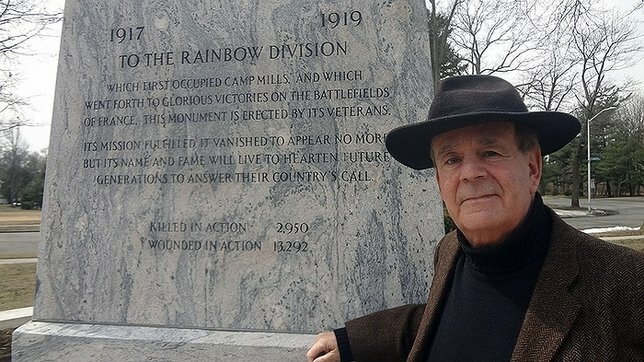 Subject: LongIsland.com - Your Name sent you Article details of "The 42nd Rainbow Division; One Man’s Quest to Shed Light On A Forgotten Aspect of Long Island’s WW1 History"